Turn off any Stat Plots that you don’t want to appear in the graph of your functions. The first line in the Y= editor tells you the graphing status of the Stat Plots. If Plot1, Plot2, or Plot3 is highlighted, then that Stat Plot will be graphed along with the graph of your functions. If it’s not highlighted, it won’t be graphed. keys to place the cursor on the highlighted Stat Plot and then press [ENTER]. The same process is used to re-highlight the Stat Plot in order to graph it at a later time. When you’re graphing functions, Stat Plots can cause problems if they’re turned on when you don’t really want them to be graphed. The most common symptom of this problem is the ERR: INVALID DIM error message — which by itself gives you almost no insight into what’s causing the problem. So if you aren’t planning to graph a Stat Plot along with your functions, make sure all Stat Plots are turned off. keys to place the cursor on the desired format and then press [ENTER] to highlight it. In the Format menu, each line of the menu will have one item highlighted. polar form. Select RectGC for rectangular form or PolarGC for polar form. CoordOn and CoordOff: This tells the calculator whether you want to see the coordinates of the cursor location displayed at the bottom of the screen as you move the cursor. Select CoordOn if you want to see these coordinates; select CoordOff if you don’t. GridOff and GridOn: If you select GridOn, grid points appear in the graph at the intersections of the tick marks on the x– and y-axes. If you select GridOff, no grid points appear in the graph. AxesOn and AxesOff: If you want to see the x– and y-axes on your graph, select AxesOn. If you don’t want to see them, select AxesOff. LabelOff and LabelOn: If you want the x– and y-axes to be labeled, select LabelOn. Because the location of the labels isn’t ideal, selecting LabelOff is usually a wise choice. ExprOn and ExprOff: If you select ExprOn, when you’re tracing the graph of a function, the definition of that function appears in the upper left of the screen. If you select ExprOff and CoordOn, then only the number of the function appears when you trace the function. If you select ExprOff and CoordOff, then nothing at all appears on the screen to indicate which function you’re tracing. Press [WINDWO] to access the Window editor. 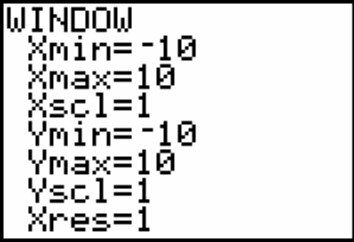 After each of the window variables, enter a numerical value that is appropriate for the functions you’re graphing. Press [ENTER] after entering each number. Xmin and Xmax: These are, respectively, the smallest and largest values of x in view on the x-axis. Xscl: This is the distance between tick marks on the x-axis. Ymin and Ymax: These are, respectively, the smallest and largest values of y that will be placed on the y-axis. Yscl: This is the distance between tick marks on the y-axis. Xres: This setting determines the resolution of the graph. It can be set to any of the integers 1 through 8. When Xres is set equal to 1, the calculator evaluates the function at each of the 94 pixels on the x-axis and graphs the result. If Xres is set equal to 8, the function is evaluated and graphed at every eighth pixel. 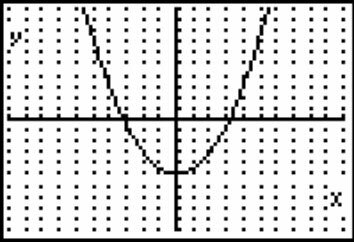 Press [GRAPH] to graph the functions.